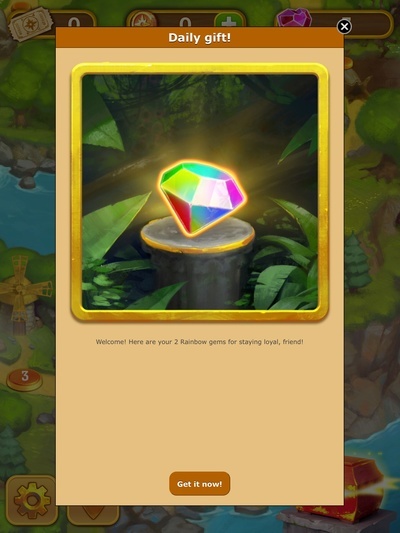 Gemcrafter: Puzzle Journey is a casual game in match 3 genre. It distinguishes itself from the crowd by tweaking the standard gameplay of the classic match 3, and also by having cute, attractive graphics. If you’re not a fan of the casual match 3 genre like Candy Crush, then there’s nothing new here for you. 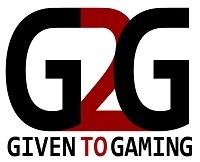 If you are, then I recommend this as it is a fresh and pleasant gameplay experience. 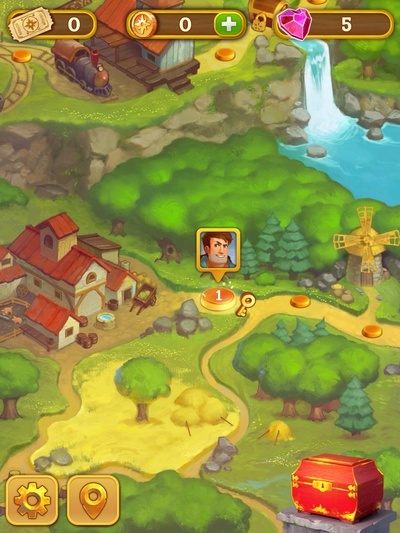 Gemcrafter: Puzzle Journey is a puzzle game in the match 3 genre. It distinguishes itself form similar rivals with better quality graphics and less random gameplay than many other match games. This makes it feel much more like a puzzle game, in which your actions can make a real difference to the outcome, rather than a series of random swipes. 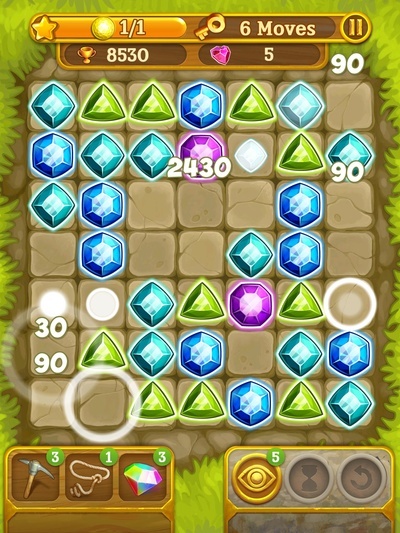 The goal of the game is to overcome challenges by moving gems around the board, matching 3 or more to upgrade the gems to the next set of colours. Rather than gems falling in from the top of the game, they instead pop up in random locations as you make moves. There are a number of tools that enable you to progress more quickly, but if you do use these, they are quickly exhausted. They can be replenished through in-app purchases, but the game does not rely on in-app purchases to unlock gaming content, or to enable you to succeed. You get 5 lives and if you repeatedly fail a level these will quickly reduce, and start to be replenished after 20 minutes. I quite like this game. I’ve played Candy Crush Saga and found it to be quite soulless and empty of character. In this game the developers have really tried to make the game some character and also a sense of progress. This comes through the gradual unlocking of different types of gem, to put in Jim Kraftwerk’s treasure box. The cons of the game: in app purchases and fixed orientation aren't dealbreakers. The in-app purchases are hardly rare in this class of game and aren't vital to keep playing as they are in some other games. Likewise, the fixed orientation is more of a personal preference. I like to interact with my iPad in landscape, so it irriates me when I am forced into a portrait orientation. In summary, I was pleasantly surprised by Gemcrafter: Puzzle Journey. It was one of my random downloads, looking for a Candy Crush clone to review, and I expected an disengaging Candy Crush Clone that I’d quickly get irritated by. Instead, it’s a fun, nice-looking game that will draw you back in to solve the latest puzzle. If you don’t like casual, match 3 type games then it’s unlikely to convert you. If you do, then I recommend this one. Does your family play board games at Christmas?